In response to the rising of artificial intelligence (AI), high-definition audio and video streaming and online live broadcast, data high-speed computing and transmission applications, Intel and AMD have launched a new generation of server platform products, including Intel’s next-generation Xeon® scalable processor family – Purley CPUs which are based on the Skylake-SP architecture and planned to replace the previous both Xeon® E5 and E7 processors powered by Broadwell microarchitecture. Purley’s new platform combines multiple platform innovations and integrates performance enhancement technologies, including Intel AVX-512, Intel MESH architecture, Optane Solid State Drive (SSD) and Omni-Path Fabric fiber optic transmission technology. Purley’s new platform also supports existing and emerging data center and network workloads, including cloud computing, high-performance computing, and artificial intelligence, etc. The evolving data center and network infrastructure are designed to deliver the industry’s highest energy efficiency and system-level performance. Its average performance is 1.65 times higher than the previous generation. Performance of Xeon® expandable processor is 2.2 times more efficient than the previous generation under the ever-increasing workload of artificial intelligence. Acrosser Technology now is providing customers the Purley’s new platform network appliances, the Acrosser first 2U IoT Rackmount Server: ANR-C627/622N1. Positioned as powerful network appliances, ANR-C627/622N1 equipped with the latest generation Intel® Xeon® Scalable processors are perfect for IoT Gateway, Edge Computing (EC), Cloud, Next Generation Firewall (NGFW), IPS/IDS, Security Gateway (Se-GW), Unified Threat Management (UTM) and Network Functions Virtualization (NFV). As excellence network appliances, ANR-C627/622N1 series support dual-socket Intel® Xeon® Scalable processors, 24* RDIMM/LRDIMM DDR4-2666, dual onboard SFP+ (10G fiber) and 8* Expandable Network Interface Modules (NIMs) for 1G/10G/40G (fiber/Copper/Bypass) various options. Strong networking ability can meet most of enterprise-class customers’ needs. Acrosser had committed its valuable resources to further develop its advanced network product lines. Furthermore, Acrosser is now working directly with Intel, as part of Intel IoT Solutions Alliance, in order to be able to offer its customers first-to-market services, the latest technologies, and solutions in a timely manner. As a member of Intel IoT Solutions Alliance, Acrosser is able to directly obtain valuable resources in providing high quality and stable performance products/solutions to its customers, vis-à-vis non-IoT-Alliance-members. In order to provide customer more choices in entry-level network solution, today ACROSSER Technology, a world-leading network appliance supplier, proudly revealed its latest micro box fan-less network appliance –AND-APL1N1FL series. 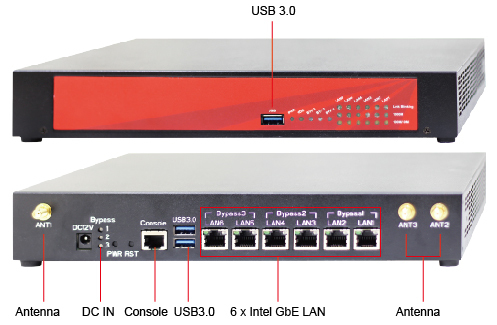 The fan-less micro box network appliance, AND-APL1N1FL, can offer the utmost connectivity with a compact form factor at dimensions 280 x 209 x 44 mm (11.02” x 8.23” x 1.73”). In addition, AND-APL1N1FL also supports 3-pair LAN bypass for Ethernet connection and provides a luxurious set of I/O, including one mini PCIe slot to support WiFi or 4G, three USB3.0 ports on the rear panel, one console port (RJ45), 8-bit GPIO on-board pin header, and one SATA III port or mSATA socket. Rich I/O ports and drive bays are designed for easy access and maintenance. AND-APL1N1FL, with compact size and reasonable cost, is the perfect solution for small office network solution, UTM, mail server and firewall applications. Acrosser Technology not only provides In-Vehicle Computer products with high reliability and availability but also with the best scalability and manageability in the industry. We hear what you need!!! To make system integrators and engineers’ job easier in the Transit and Railway market, Acrosser Technology integrated PoE (Power-over-Ethernet) feature to its new In-Vehicle PC product to not only simplify the deployment process but also enhance the communication quality. Acrosser AIV-Q170V1FL is equipped with the latest Intel Skylake-S 6th Core i CPU, features 4 x POE GbE LAN port with RJ45 connectors (802.3at, total 60W max) , 2 x swappable 2.5” SSD bay, 8 x USB 3.0 ports, and supports 3 x Mini PCI-e (For 4G & GPS module with 2 x SIM card Socket, Wi-Fi/Bluetooth, G Sensor, Dead Reckoning , CAN BUS or OBD II J1939 and etc ), all put together to offer a full-function rugged rolling stock and moving vehicle PC. Having AIV-Q170V1FL running at different customer sites, most customers were elated by the convenience of the PoE (Power-Over-Ethernet) feature which can support PoE cameras via simple wiring, distribute the power directly through the port, and replace the traditional power cords. Simply put, with PoE, users can easily and economically build an internet environment and install surveillance system on vehicles. Besides, Acrosser AIV-Q170V1FL is designed with many essential features for onboard computers such as wide operating temperature, anti-shock, and vibration, fan-less enclosure for higher MTBF, and smart power management. All in all, with all the features mentioned above, Acrosser AIV-Q170V1FL In-Vehicle PC will be adequately fit in Delivery Truck/Service Truck Fleet for tracking and route planning applications, and also can be installed in ambulances to provide better communication with the hospital via 4G LTE/Wi-Fi while implementing Telemedicine. It will also be very suitable to run in any commuter bus/tourist bus as surveillance system and passenger counter. Overall speaking, within advanced PoE function, this brand new Acrosser AIV-Q170V1FL can facilitate faster deployment of mobile networking on vehicles by eliminating the need for power outlets at every end-point and is designed to meet and fulfill most requirements from customers by accomplishing the desired results of efficient Telematics. Acrosser Technology not only provides In-Vehicle Computerproducts with high reliability and availability but also with the best scalability and manageability in the industry. Acrosser Technology is your best choice for building Telematics applications in today’s IoT environment. Acrosser is able to directly obtain valuable resources in providing high quality and stable performance products/solutions to its customers, vis-à-vis non-IoT-Alliance-members.